This morning when I had a bath, I refused to wash my arm and took great care not to get it wet. 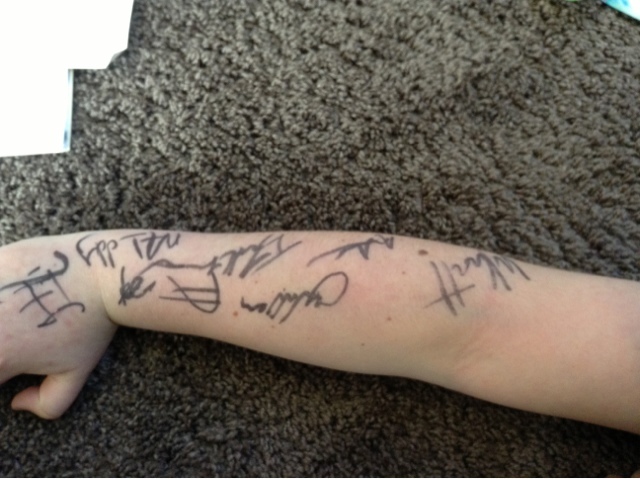 My arm is covered from wrist to elbow in signatures from the Otago rugby players that visited our school. Some children got to tackle the rugby players. Seth McKeay managed to bowl one of the rugby players over. I hope they come again this year. It looks like you got signatures' from everyone there that day. Do you know there is a special name for animportant persons signature? I wonder if you can find out? My favourite player wasn't there that day. He is Haden Parker. He is a real good kicker.